Happy Monday to everybody! I just wanted to share with you an idea Amy came across. Amy is an avid reader of blogs, and possibly reads blogs written by as many as ten to fifteen distinct bloggers. Well, on one of the many blogs Amy reads, she came across an idea of an inspiration board. This inspiration board is more or less a collection of images and quotes which serve to give inspiration and remind you of all the things you aspire to accomplish. Amy was very excited to make an inspiration board, and I jumped on the inspiration board train as well; so, we headed over to Staples, picked up some cork boards and some push pins, and went to work searching for images and quotes for these boards. I took this idea, and tweaked it slightly. Instead of using the entire board to show everything I wanted to accomplish and could use as motivation, I divided my board in half. One side dedicated to my goals for 2012, and the other for my accomplishments this year. On the goals side, I have the Race Logos of the races I am currently signed up for, some time goals for races, my distance goals for the year, and some other assorted things I would like to accomplish. As I accomplish these goals, they will be moved over to the accomplishments side of the board. Hopefully, by the end of 2012, there will be nothing left on the goals side of the board. Amy stuck more with some of the examples she had seen on the blog she found this idea on. 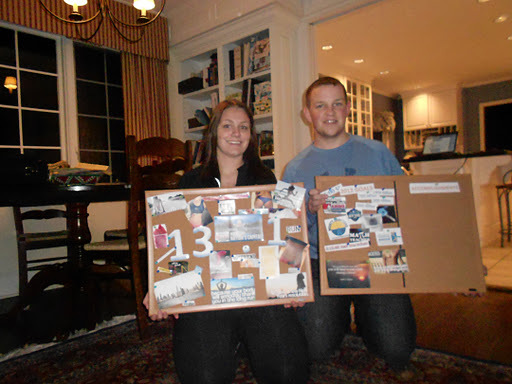 Here is a picture of the two of us showing off our hard work, and craft skills! I definitely like this idea a lot! Sometimes it is beneficial to no only think about your goals, or write them down, but have a visual of them as well. 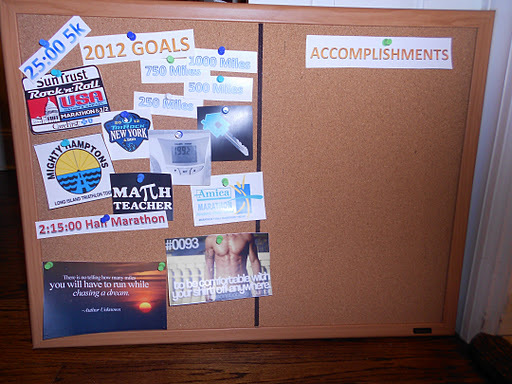 There have definitely been times in the past where I felt I haven’t accomplished anything, and with this goals board, if you make your goals small enough (such as go for a run today) you can put it in the goals in the morning, and after you hit that run, you can put it in the accomplishments. Goals do not have to be ‘lose 100 lbs’ or ‘run 5 marathons’. Use different types of goals. Big goals, small goals, lofty goals, reachable goals, any other goals you can think of. Use this board as visual proof of all the things you are accomplishing and a reminder of all the hard work that went into making it happen!